Broun also discussed prohibition. 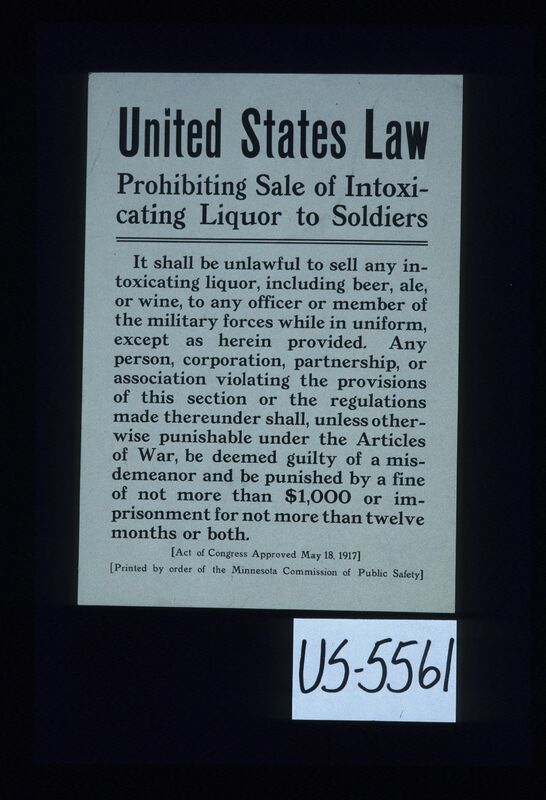 For him, barring the sale of champagne and cognac to enlisted men was “all that the army needs.” This prohibition of stronger alcohols to enlisted men is identical to a British policy mentioned here, which prohibited the sale of champagne, cognac, and other spirits to enlisted men. He argued that beer, the most popular drink among the AEF, along with “light wines” were “not a menace to the health or behavior of our army.” He assuaged home front fears by saying that attempting intoxication from the low-alcohol wartime beers would cause a man to drown before becoming drunk. Another United Committee on War Temperance image equating alcohol with the German enemy. The temperance movement equated abstaining from alcohol with patriotism and morality. This is seen in the above postwar poster, which equates alcohol with the defeated Germany enemy. This is similar to a French poster discussed in this entry. The upright, moral American soldier was cast as a kind of crusader for both democracy and temperance, in contrast to undemocratic and, by extension, alcoholic European enemy powers. War prohibition was enacted by Congress in November 1918, ostensibly to save grain for bread production. However, the war did not cause the prohibition movement to succeed. Many states and locales had already prohibited alcohol. The Woman’s Christian Temperance Union and the Anti-Saloon League were powerful political forces before the war had even begun. They labeled beer “Kaiser brew” and tapped into anti-immigrant sentiment and patriotic feeling by castigating German-American brewers, one of the key groups opposing prohibition, as just as big of a threat to America as the German Empire. This poster for the Minnesota Commission of Public Safety outlines the laws and penalties associated with providing alcohol to US Servicemen. 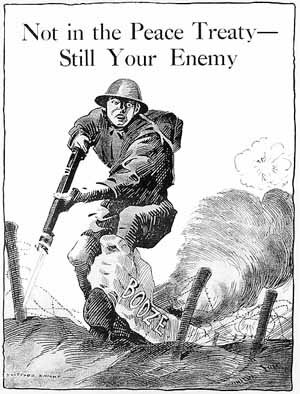 The anti-alcohol campaign manifested itself on the Western Front most notably in YMCA camps frequented by American troops. These camps were forerunners to the USO and staffed by uniformed YMCA officials. 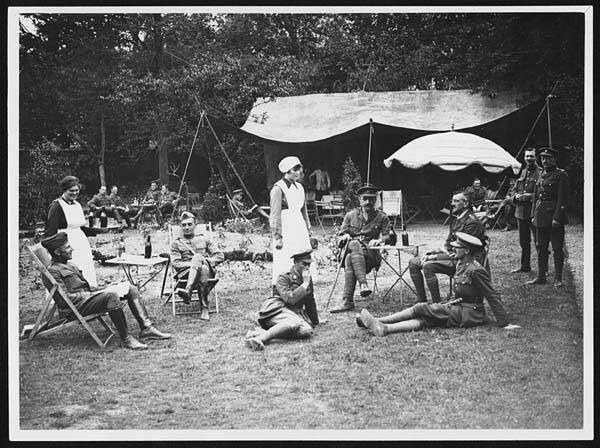 These camps were meant to provide “wholesome” entertainment to troops and distract them from French cafes, brothels, and the like. They offered games, sold cigarettes, catered to religious and spiritual needs, and provided other forms of entertainment. In his anti-war novel Three Soldiers, John Dos Passos portrays a YMCA official, the “Y” Man, as a hypocritical, cowardly figure propping up the machine-like system of modern society and warfare. The “Y” Man is out to swindle the soldier out of his wage by overcharging for cigarettes and chocolate while dispensing saccharine sermons about the American cause and the barbarity of the German foe. Dos Passos, himself an ambulance driver during the war, portrays American soldiers as thoroughly enjoying the comforts of wine, beer, and other drinks in French villages behind the lines in much the same way as French and British accounts portray their own soldiers. The character Fuselli develops an infatuation with a French girl, Yvonne, who works at one of the many cafes behind the lines that served alcohol to enlisted men. Intoxication and the desire to “live” is ever-present among the novel’s characters, whether they are behind the lines or exploring Paris in 1919. Three Soldiers is full of scenes in which American soldiers are drinking, becoming drunk, wandering the streets and looking for female companionship. Dos Passos presented a relatively unvarnished (for its time) depiction of Army life that made no effort to hide the reality of the American soldier’s experience in France, be it in the trenches or behind the lines. “I’m going to have some more wine,” said Andrews. Antoinette brought a bottle of cognac and two small glasses and sat down in an empty chair with her red hands crossed on her apron. Her eyes moved from Chrisfield to the Frenchman and back again. Chrisfield turned a little round in his chair and looked at the Frenchman, feeling in his eyes for a moment a glance of the man’s yellowish-brown eyes. Andrews leaned back against the wall sipping his dark-colored wine, his eyes contracted dreamily, fixed on the shadow of the chandelier, which the cheap oil-lamp with its tin reflector cast on the peeling plaster of the wall opposite. This photograph shows American officers (left) and British officers (right) drinking beer with British nurses behind the lines in 1918. Because the American military did not issue alcohol to its troops, drinking behind the lines was the only option Doughboys had. Drinking behind the lines was an issue that the American Army took seriously but could ultimately do nothing about. Heywood Broun’s account discusses the issue in detail. For him, full prohibition was impossible for an army stationed in France due to the sheer ubiquity of establishments that served alcohol. Although some French advocated the prohibition of strong liquors, Broun argued that even these French citizens would be puzzled by any attempt to limit access to wine and beer, which were seen more as foodstuffs than intoxicating drinks. His account mentions bouts of binge drinking when the AEF first arrived in France, but claims that this ended relatively quickly. For him, the best preventative measure against alcoholism was what he called the “French fashion of making drinking deliberate and social.” He argued that once American soldiers began to drink “deliberately” in cafes, they abstained from their previous binge-drinking due to French locals and poilus teaching them a proper method. Small incidents like these would have been the exception. 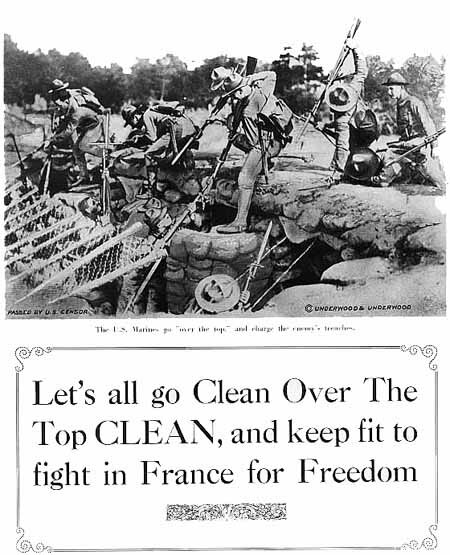 Unlike the other Allied forces on the Western Front, the American soldier and Marine had to get through life in the trenches “clean”at all times. When American troops did go behind the lines, they did not abstain from alcohol as much as prohibitionists at home would have liked. However, the war experience would have little impact on prohibition. Although 2 million Americans served in France, the prohibition movement had already gained political power at home and would push through temperance legislation culminating in the ratification of the 18th Amendment in January 1919. The next post of this series will focus on the German Army on the Western Front. ← Previous Post The Father of the (Financial) War on Terror is the War on Drugs? Nicholas Johnson continues his fantastic series at the Points blog on alcohol and the Great War. Part 3 points out that the Prohibition movement prevented American troops from being issued any rations of alcohol. Unlike their allies, American soldiers could only drink behind the lines. Unsurprisingly, they did drink behind lines. Johnson describes American soldiers binge drinking during the war. I’m looking forward to part 4.